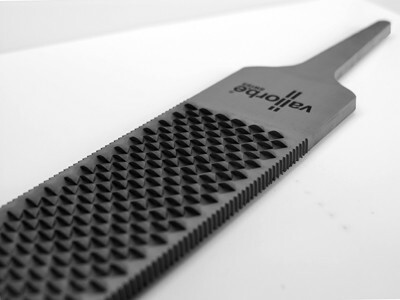 Vallorbe Swiss have been manufacturing rasps and files for over a century and their long experience is evident in this high quality horse hoof rasp, sharpened by the exclusive V-sharp technology. 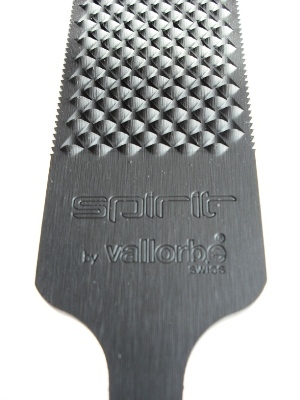 The Vallorbe Swiss® V-Sharp rasp STANDS OUT FROM THE COMPETITION IN . . .
Vallorbe Swiss® has developed an extremely sharp tooth which gives the rasp exceptional, long-lasting and regular cutting power for maximum performance. Vallorbe rasps last considerably longer than other rasps due to the high quality steel used. They do not clog and they give a high quality finish. Rasp has an extremely sharp cut on rasp side, longer service life, novel shape of the teeth promoting the evacuation of chips, double cut on file side for excellent finish.